Miller played 243 passing snaps in his rookie season for the Texans, and lined up in the slot 66.7 percent of the time. He accumulated 56 total yards from 154 routes run, before a foot injury ended his season in Week 13. His catch rate of 62.5 ranked 40th of 54 receivers with at least 190 routes ran from the slot. In his first year in the league, Miller earned a PFF overall grade of 47.4, ranking 113th of 115 wide receivers. 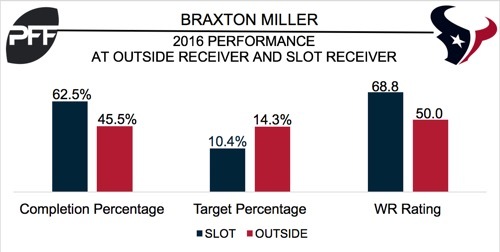 Of the four Houston wide receivers who saw more than 10 targets in the slot, Miller ranked third with a wide receiver rating of 68.8.